Do You Have a Quilting PhD? Thank you to everyone who entered my blog contest by answering the question “Why Do You Quilt?”. It was really fun hearing all the different answers. There were several recurring themes….being creative; giving gifts from the heart; challenging yourself yet having fun & relaxing; being therapeutic or relieving stress; nourishing the soul, an ego booster and the friends and community found within the quilting world. Wow – I wonder how many other hobbies can offer us all of those things?? Aren’t we lucky! Speaking of lucky, I used a random number generator and came up with our winner………Julie Thomsen!! Julie gets her choice of any of my cotton wide backings (not flannel or batiks, sorry). I’ve sent you an email, Julie, please reply with your choice of fabric and your mailing address and I’ll get your prize out to you. And don’t forget, if you didn’t win this time, there is a 2nd way you can win. (See rules here next to the #2 symbol.) Purchase any of my wide backs during March and you will be entered into the second drawing. At the end of the month I will choose one ticket and refund the amount of that backing to the customer. Click here to shop my wide selection of quilt backings. 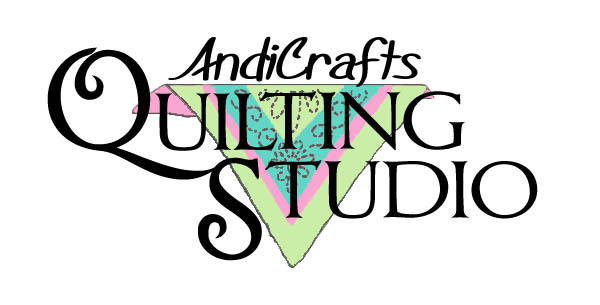 If you are on Facebook and have not ‘Liked’ my AndiCrafts Quilting Studio page yet, be sure and do so. You don’t want to miss out on the quilt photos, funny links, and Facebook only specials.